Check out today's pricing and retail availability for Murphy-Goode Alexander Cabernet Sauvignon. 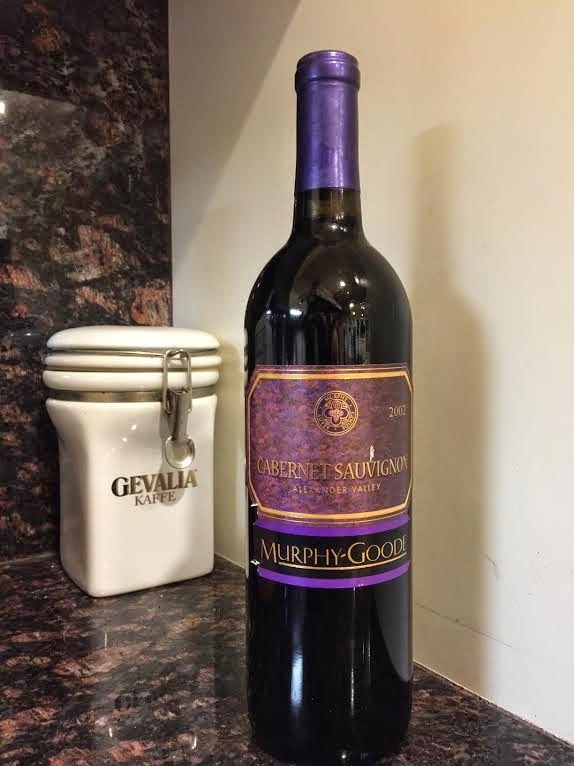 Original tasting and review : This is Murphy-Goode Cabernet Sauvignon, Alexander Valley, Sonoma County, California, 2002, finished at 13.5% alcohol and first sampled a whopping 12 years from vintage date, in December, 2014. In the glass: Deep mahogany, opaque from a half inch of the edge. On the nose: Poured at cool room temperature and swirled vigorously, shows deep, fat boiled blackberries with a nice cedar-based surround sound. From the aroma, seems like this will be fat, of course, sweet and rich with soft tannin residue. On the palate: The primary elements on the palate are in fact deep with veinous aromatics of black plum and rich blackberry and plenty of cedar, as suggested by the nose. Shows no hint of age or tiredness. In fact, still sports a lively, bright verve that lifts the deep fruit. Tannins only show as a mechanism for holding a long, clean finish in your cheeks. A tiny spurt of acid peeks out at the end. In summary: Overall, rates a brilliant, long-lived four stars on the five-star Spirit of Wine scale. Best value, even after all these years! (c) Copyright 2014 Spirit of Wine, all rights reserved. If you are a winery, distributor or marketing agent and you would like to see your (or your client's) wine featured at Spirit of Wine, here are two options: 1) Wait, pray and hope - we may find you someday; 2) Submit a wine for review. No charge. Particulars are here. If you are reading this full posting on any site other than Spirit of Wine, chances are it is a copyright violation.